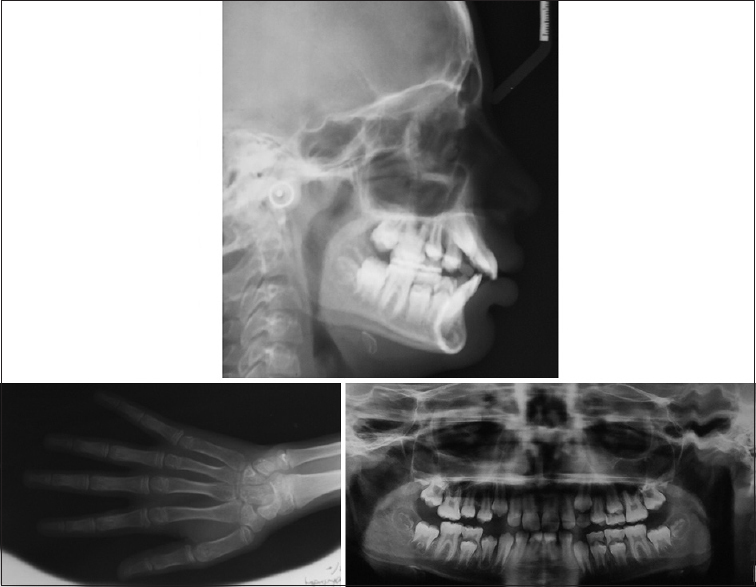 A 10-year-old female presented with a skeletal Class II relation with 7 mm of overjet, 40% overbite, and bilateral posterior lingual crossbite. Two-phase therapy was planned to correct Class II skeletal relation, overjet, overbite, and to achieve lip competency. Phase I therapy was done with twin-block appliance to advance the retrognathic mandible. Phase II therapy was accomplished with fixed appliance for arch coordination to correct minor displacement and to finalize occlusion. Posttreatment, skeletal Class I relation was achieved. Incisors' inclination was improved, and ideal overjet and overbite with bilateral class I molar relationship was achieved. As the mandible advanced, lip competency, facial convexity, and mentolabial sulcus improved. Keywords: Class I; Class II; overbite; overjet; twin-block appliance; two-phase therapy. Class II malocclusion presents in a wide variety of skeletal and dental configurations. Although maxillary protrusion and mandibular retrognathism are both found to be possible causative factors, McNamara  reported that mandibular retrognathism is the most consistent diagnostic finding in skeletal Class II malocclusions. A number of treatment options are available for the correction of skeletal Class II malocclusions such as functional appliances, extraoral appliances, and surgical repositioning of the jaws. Functional appliance therapy has become an increasingly popular method of correcting Class II malocclusion during growth period. These appliances direct the pattern and direction of growth of the jaws by alteration of the forces produced by the neuromuscular complex. A restraining effect on the growth of maxilla and maxillary dentoalveolar complex is also seen along with the stimulation of mandibular growth and mandibular alveolar adaptation with functional appliance treatment. A plethora of functional appliances such as the bionator,, the FR-2 of Fränkel,,, the fixed and removable types of Herbst appliances,, and the Jasper Jumper  have gained widespread popularity for Class II correction in the last few years. Functional appliance system that has been successful during the last two decades is the twin-block appliance., Twin-block appliance was developed by Clark of Fife, Scotland, for use in the correction of Class II malocclusions characterized in part by mandibular skeletal retrusion., The popularity of twin block is attributed to its high patient adaptability and ability to produce rapid treatment changes. A major advantage of twin-block appliance is its relatively smaller size compared to other functional appliances. The appliance consists of maxillary and mandibular acrylic plates with bite blocks, which interlock at a 70° angle on closure while posturing the mandible forward., The fact that it comes in two parts rather than as a mono bloc is said to enhance patient compliance and minimize speech disturbance. This case report demonstrates treatment of a patient with Class II Division I malocclusion using two-phase therapy. The first phase of treatment was accomplished with twin-block appliance and phase II with fixed appliance. A 10-year-old female reported with a chief complaint of “front teeth sticking out.” No relevant medical history was reported. Extraoral examination [Figure 1] revealed a mesocephalic head shape, mesoprosopic face type, retrognathic mandible, convex profile, and deep mentolabial sulcus. No abnormality was detected in the temporomandibular joint. Intraoral examination revealed a Class II molar relationship, 40% overbite, 7 mm of overjet, and bilateral posterior lingual crossbite. The patient was in the mixed dentition stage. Both arches were grossly symmetrical. Upper midline was shifted by 1.5 mm to the right side in relation to facial midline [Figure 2]. Panoramic radiograph showed presence of all 28 teeth with no evidence of bone loss. The lateral cephalometric radiograph revealed ANB of 5° and Wits appraisal of 2.5 mm, indicative of a Class II skeletal pattern. 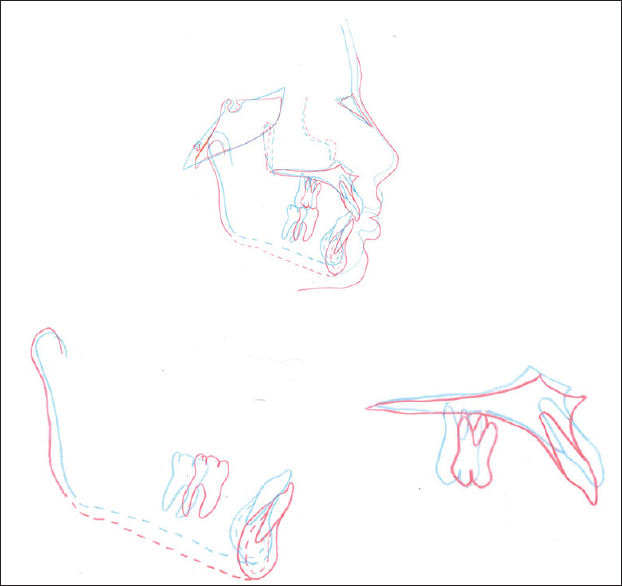 An SNB angle of 78° indicated that the mandible was retrognathic [Figure 3]. The skeletal pattern was horizontal as evidenced by the SN-MP angle of 20°. 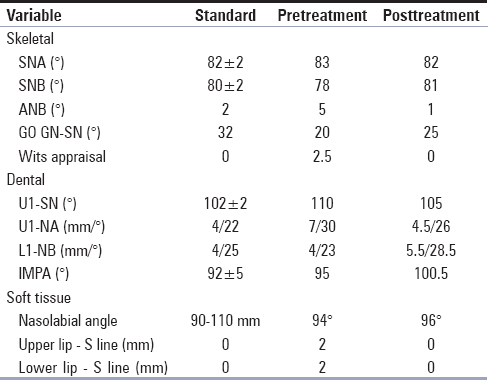 Maxillary incisors were proclined with U1-NA-7 mm/30° and mandibular incisors were upright over the basal bone with L1-NB-4.5 mm/23° [Table 1]. Hand-wrist radiograph suggested that 65%–85% of growth was left according to Bjork, Grave, and Brown method. Cervical vertebrae indicated acceleration period of growth. The objectives of Phase I therapy were to advance the retrognathic mandible to correct skeletal Class II relation and to reduce convexity of the face. The objectives of Phase II therapy were to maintain space for erupting permanent teeth, reduce upper incisor proclination, correct lingual posterior crossbite, and settling the occlusion. The main criteria in determining treatment plan were the skeletal Class II relation with retrognathic mandible and overjet. Two-phase therapy was planned. Phase I therapy was planned with twin-block appliance to advance the retrognathic mandible to correct skeletal Class II relation. Phase II therapy was planned with fixed appliance for arch coordination to correct minor displacement and to detailing the occlusion. Phase I treatment involved the use of twin-block appliance to advance mandible, to reduce overjet, and to achieve Class I skeletal relationship [Figure 4]. The design of the upper component of twin-block appliance included an acrylic base plate which covered the palate and occlusal surfaces of the first molars and second premolars. There was an inclined plane at the end of the mesial end of acrylic block. A labial bow was used for anterior retention of the appliance. A midline screw was also included. The jack screw was activated at a rate of 0.5 mm/week for 8 weeks to achieve a maxillary expansion of 4 mm. The lower component consisted of a lingual acrylic base plate covering the edge of the lower incisors. Both blocks had Adams clasps on the first molars and first premolars to provide posterior retention. Use of twin-block appliance was discontinued after 12 months of treatment [Figure 5]. An upper twin-block retainer providing a positive incisal stop was delivered to be worn full time for 3 months. This phase was followed by fixed appliance to close spaces and for finishing and detailing. MBT appliance (Ormco, Glendora, CA, USA) 0.022 × 0.028˝ slot was used. An expanded transpalatal arch was placed in the upper arch and constricted lingual arch in the lower arch to correct lingual crossbite and to enhance anchorage. Alignment and leveling was accomplished with the following sequence of archwires: (a) 0.016˝ heat-activated nickel-titanium archwires (b) 0.018˝ stainless steel archwires, and (c) 0.017 × 0.025˝ stainless steel archwires [Figure 6]. The archwires were cinched distal to molar to avoid maxillary and mandibular incisor proclination. After aligning and leveling, both arches were coordinated on 0.019 × 0.025˝ stainless steel archwires. Finishing was done by 0.021 × 0.025˝ titanium molybdenum alloy archwires. The settling was accomplished by 0.021 × 0.025˝ braided stainless steel archwires with vertical settling triangular elastics. Case was debonded, and upper- and lower-bonded lingual retainers were given. The active treatment ended in 26 months. The patient is being recalled for every 6 months for follow-up. The change in the patient's facial esthetics was the most impressive part of her treatment. With twin-block therapy, 3 mm advancement of the mandible was achieved which fixed skeletal Class II relation into skeletal Class I relation. Her lip competency [Figure 7] and facial convexity were improved. Bilateral Class I molar relationship was achieved. Dental midline was corrected in relation to facial midline. Bilateral posterior lingual crossbite was corrected and ideal overjet and overbite was achieved. Posttreatment, intraoral photographs and lateral cephalogram [Figure 7],[Figure 8],[Figure 9] showed that the maxillary and mandibular incisors were inclined appropriately. The soft tissue chin thickness improved as the lip strain was reduced. The panoramic radiograph [Figure 9] showed adequate root parallelism in both the upper and lower arches. The main objective of therapy with functional appliances is to induce supplementary lengthening of the mandible by stimulating increased growth at the condylar cartilage. The existence of a pubertal peak in mandibular growth has been described previously in classical cephalometric studies.,,,,, The peak growth velocity would be expected around age 12 years in girls and age 14 years in boys. Petrovic et al. revealed that the therapeutic effectiveness of various functional appliances is most favorable when these appliances are used during the pubertal growth spurt., However, it seems desirable to stimulate mandibular growth as much as possible in young patients with retrognathic mandibles with the objective of avoiding more complex treatment after maturity. There were several reasons for choosing to begin treatment early. First, McNamara et al., have shown that the earlier treatment starts, the more skeletal correction is achieved. Second, the nature of twin-block appliance design makes it more suitable for treatment when there are solid deciduous molars available for clasping purposes. Third, younger patients generally adapt more readily to wearing removable appliances and are less likely to have speech difficulties than their teenage counterparts. Thus, it was considered preferable to intervene early with twin-block treatment to decrease the skeletal dysplasia before the patient reached her teen years. The positive esthetic outcome at the end of two-phase treatment in our case can be attributed to skeletal and dentoalveolar changes produced by twin-block appliance. Posttreatment, the patient experienced an increase in SNB angle of 3°, from 78° to 81°. This was most likely a result of increased mandibular growth. In contrast, there was 1° reduction in SNA angle from 83° to 82° which can be attributed to the “headgear effect” produced by the twin-block appliance. Mills and McCulloch reported similar changes in SNA and SNB measurements in their study. Functional appliances have been criticized for their tendency to procline the lower incisors and retract the upper incisors., Mandibular incisor proclination was increased by 5.5° in this case. Various studies have reported lower incisor proclination of 2.8° to 7.9°, after twin-block appliance therapy.,, This proclination is probably due to the anchorage loss in response to keeping the mandible in a protrusive position., Lower incisor proclination aids in achieving the initial overjet correction but reduces the scope for a skeletal component in the overjet correction. Moreover, proclination of lower incisors is proven to be unstable over the long term and is liable to relapse. Therefore, an additional stage of treatment may be required to upright the lower incisors. Maxillary incisor proclination was reduced from 110° to 105° in this case. This lingual tipping may be due to the labial bow in the twin-block appliance  or due to contact of the lip musculature during treatment. Overjet was reduced from 7.5 mm to 1.5 mm in this case which was attributed to the skeletal and dental changes. A second phase of treatment, using fixed appliance therapy, is necessary to correct other occlusal irregularities and to obtain finer detailing of occlusion. Use of a twin-block appliance in the first phase of treatment reduces the expected duration of fixed appliance therapy in the second phase of treatment; it also has the advantage of avoiding fracture of proclined maxillary incisors. Patients' facial esthetics will be greatly improved within a reasonably short period of time without having to delay treatment until the early permanent dentition. In addition, the risk of external apical root resorption, which has been reported to be higher in one-phase than in two-phase treatments, has been reduced., Furthermore, the need for a two-unit extraction in the upper arch as part of the fixed appliance therapy or orthognathic surgery has been eliminated. This case was successfully treated with two-phase therapy. Growth modulation was achieved with twin-block appliance in phase I and occlusion was finalized with fixed appliance in phase II. The mandible was advanced by 3 mm [Figure 10]. Twin-block appliance therapy results in both skeletal and dentoalveolar adaptations. Skeletal Class I relation was achieved, facial convexity decreased, and competency of lips achieved. The patient presented a positive smile arc with a pleasing smile at the end of the treatment. Jena AK, Duggal R, Parkash H. Skeletal and dentoalveolar effects of twin-block and bionator appliances in the treatment of Class II malocclusion: A comparative study. Am J Orthod Dentofacial Orthop 2006;130:594-602. McNamara JA Jr. Components of Class II malocclusion in children 8-10 years of age. Angle Orthod 1981;51:177-202. Balters W. Die technik und übung der allgemeinen und speziellen bionator-therapie. Quintessenz 1964;1:77. Johnston I. Skeletal and dentoalveolar changes in patients treated with a bionator during prepubertal and pubertal growth. In: McNamara JA Jr., Ribbens KA, Howe RP, editors. Clinical Alteration of the Growing Face. Monograph 14, Craniofacial Growth Series. Ann Arbor: Center for Human Growth and Development, the University of Michigan; 1983. Fränkel R. The theoretical concept underlying the treatment with function correctors. Rep Congr Eur Orthod Soc 1966;42:233-54. Fränkel R. The treatment of Class II, Division 1 malocclusion with functional correctors. Am J Orthod 1969;55:265-75. Fränkel R, Fränkel C. Orofacial Orthopedics with the Function Regulator. Munich: S. Karger; 1989. Pancherz H. Treatment of Class II malocclusions by jumping the bite with the Herbst appliance. A cephalometric investigation. Am J Orthod 1979;76:423-42. Pancherz H. The Herbst appliance – Its biologic effects and clinical use. Am J Orthod 1985;87:1-20. Jasper JJ, McNamara JA Jr. The correction of interarch malocclusions using a fixed force module. Am J Orthod Dentofacial Orthop 1995;108:641-50. Clark WJ. The twin block traction technique. Eur J Orthod 1982;4:129-38. Clark WJ. The twin block technique. A functional orthopedic appliance system. Am J Orthod Dentofacial Orthop 1988;93:1-18. Clark WJ. The twin block technique. Part 1. Funct Orthod 1992;9:32-4, 36-7. Clark WJ. The twin block technique. Part 2. Funct Orthod 1992;9:45-9. Gill DS, Lee RT. Prospective clinical trial comparing the effects of conventional Twin-block and mini-block appliances: Part 1. Hard tissue changes. Am J Orthod Dentofacial Orthop 2005;127:465-72. Clark WJ. Book Review: Twin-Block Functional Therapy-Applications in Dentofacial Orthopaedics. 2nd ed. St. Louis: Mosby; 2002. Baccetti T, Franchi L, Toth LR, McNamara JA Jr. Treatment timing for twin-block therapy. Am J Orthod Dentofacial Orthop 2000;118:159-70. Mills CM, McCulloch KJ. Treatment effects of the twin block appliance: A cephalometric study. Am J Orthod Dentofacial Orthop 1998;114:15-24. Nanda RS. The rates of growth of several facial components measured from serial cephalometric roentgenograms. Am J Orthod 1955;41:658-73. Bjork A. Variations in the growth pattern of the human mandible: Longitudinal radiographic study by the implant method. J Dent Res 1963;42:400-11. Hunter CJ. The correlation of facial growth with body height and skeletal maturation at adolescence. Angle Orthod 1966;36:44-54. Ekström C. Facial growth rate and its relation to somatic maturation in healthy children. Swed Dent J Suppl 1982;11:1-99. Lewis AB, Roche AF, Wagner B. Pubertal spurts in cranial base and mandible. Comparisons within individuals. Angle Orthod 1985;55:17-30. Hägg U, Pancherz H, Taranger J. Pubertal growth and orthodontic treatment. In: Carlson DS, Ribbens KA, editors. Craniofacial Growth during Adolescence. Craniofacial Growth Monograph Series. Vol. 20. Ann Arbor: Center for Human Growth and Development, the University of Michigan; 1987. Tanner JM. Growth at Adolescence. 2nd ed.. Springfield, Ill: Charles C. Thomas; 1962. Petrovic A, Stutzmann J, Lavergne J, Shaye R. Is it possible to modulate the growth of the human mandible with a functional appliance? Int J Orthod 1991;29:3-8. Petrovic A, Stutzmann J, Lavergne J. Mechanism of craniofacial growth and modus operandi of functional appliances: A cell-level and cybernetic approach to orthodontic decision making. In: Carlson DS, editors. Craniofacial Growth Theory and Orthodontic Treatment. Craniofacial Growth Monograph Series. Vol. 23. Ann Arbor: Center for Human Growth and Development, the University of Michigan; 1990. McNamara JA Jr., Connelly TG, McBride MC. Histologic studies of temporomandibular joint adaptations. In: McNamara JA Jr., editor. Determinants of Mandibular Form and Growth, Monograph No. 4, Craniofacial Growth Series. Ann Arbor: Center for Human Growth and Development; 1975. p. 209-27. McNamara JA Jr. Functional adaptations in the temporomandibular joint. Dent Clin North Am 1975;19:457-71. Gianelly AA. One-phase versus two-phase treatment. Am J Orthod Dentofacial Orthop 1995;108:556-9. Mills JR. Clinical control of craniofacial growth: A skeptic's viewpoint. In: McNamara JA Jr., Ribbens KA, Howe RP, editors. Clinical Alterations of the Growing Face. Monograph 14, Craniofacial Growth Series. Ann Arbor: Center for Human Growth and Development, the University of Michigan; 1983. p. 17-40. Cope JB, Buschang PH, Cope DD, Parker J, Blackwood HO 3rd. Quantitative evaluation of craniofacial changes with Jasper Jumper therapy. Angle Orthod 1994;64:113-22. Toth LR, McNamara JA Jr. Treatment effects produced by the twin-block appliance and the FR-2 appliance of Fränkel compared with an untreated Class II sample. Am J Orthod Dentofacial Orthop 1999;116:597-609. Lund DI, Sandler PJ. The effects of twin blocks: A prospective controlled study. Am J Orthod Dentofacial Orthop 1998;113:104-10. Mills CM, McCulloch KJ. Posttreatment changes after successful correction of Class II malocclusions with the twin block appliance. Am J Orthod Dentofacial Orthop 2000;118:24-33. Ghafari J, Shofer FS, Jacobsson-Hunt U, Markowitz DL, Laster LL. Headgear versus function regulator in the early treatment of Class II, division 1 malocclusion: A randomized clinical trial. Am J Orthod Dentofacial Orthop 1998;113:51-61. Justus R. Are there any advantages of early Class II treatment? Am J Orthod Dentofacial Orthop 2008;134:717-8. Brin I, Tulloch JF, Koroluk L, Philips C. External apical root resorption in Class II malocclusion: A retrospective review of 1- versus 2-phase treatment. Am J Orthod Dentofacial Orthop 2003;124:151-6. Class I; Class II; overbite; overjet; twin-block appliance; two-phase therapy.